Where is Flyme 6 stable update? November 2016, we all rejoiced the launch of the most awaited Flyme 6. Flyme 6 is just not an updated version of Flyme OS, it is designed to enhance the way you will experience our devices. We have been talking a lot about Flyme 6, incredible animations and amazing features which is loaded with goodness. However, every time we shared the features, all that we got to hear & read was “When is the Flyme 6 stable releasing?”. We really appreciate your passion for Flyme 6 and the enthusiasm towards experiencing it, we offer our sincere apologies for our communication issues and for the delay. We created the Flyme forum to build a community that canhelp in contributing to Flyme’s development. It’s not a promotional or a marketing channel for us. It’s a philosophy that pervades everything we do, and software is a big part of what we do at MEIZU. It's been a group effort since the very beginning with the help of our 300+ global beta testers giving us continuous feedback & suggestions. 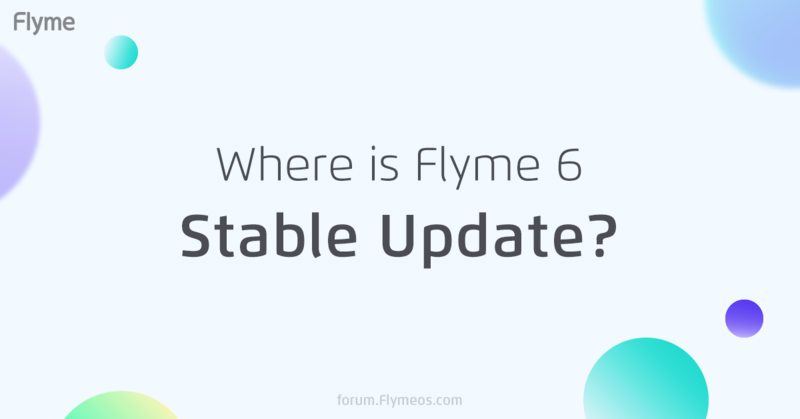 Going back to the curios question, our friends –“When is Flyme 6 Stable going to release officially?”. Here’s the short answer: It all goes back to that “Created Together” belief we hold close to our heart. We want to make sure that every feature, tweak, and addition to Flyme 6 passes the ultimate test: the scrutiny of, well, you. Thus keeping in account the current status of the firmware, we will start rolling out stable version of Flyme 6 from July. The models will receive update one by one, beginning with M3 Note, M2 followed by the rest of the devices (MX4, MX4Pro, M1Note, M2Note, MX5, PRO5, PRO6, M3s, MX6, U10, U20, M3E, M3Max, PRO6 Plus). M5, M5s and M5 Note the update will be released later, since these 3 models are relatively new in the market. To help us accomplish this goal before time, Flyme development follows three release cycles: Closed Beta, Open Beta, and Official Release. At every step of the way, we collect feedback, bug reports, and feature requests directly from our community. And, now you know the extensive level of community input and testing that takes place before a single line of code ever reaches your device. If you want to experience brand new Flyme 6 features (and aren’t afraid of some little bumps along the way), you can flash the released Open Beta Version. You will be heard, feel free to drop in your suggestions in the forum bugs & feedback section. We hope that this post helped in enlightening you all, as to what we’re doing and how much we value your input and that we are working hard to get you the best Flyme 6 stable version. Flyme is a true passion project for MEIZU, and we couldn’t do it without you. We need your trust and support in this journey as we commit to create things together. why did u miss mx6 from last update? It will gets updates? may be... it'll have Volte... will it...? *will it gets any updates? from july, not All Device get flyme 6..
i.e remove all chinese apps from A and add other languages and name it G.
There are more valuable suggestions but no one read it or reply on it that, why you all don't like it.